My recent thoughts on the 2011 Oscars noted down some of the movies I most wanted to watch – Black Swan of course being one of them. I finally got around to watching it and I closed the black-out curtains, turned off all the lights, turned the volume up and totally immersed myself in the film. I’ve heard so many people watch it and then say it was disturbing – I was truly intrigued. I’m glad I did settle down and watch it properly because boy is it one intense movie, there’s barely any dialogue but you are on the edge of your seat the entire time. But then Darren Aronofsky does have a knack for turning out very unsettling movies, I remember first watching the black and white almost entirely silent Pi way back in 1998. Requiem for a Dream was an absolute masterpiece, I have to say I truly hated The Fountain – but then The Wrestler saved him again for me. 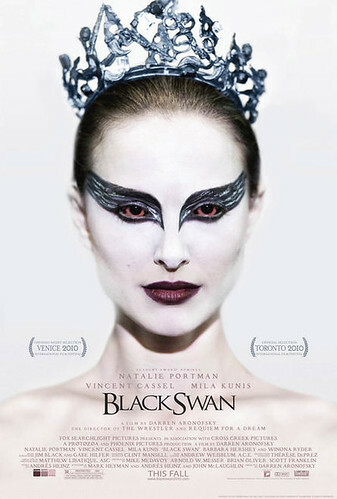 Once again with Black Swan he’s turned out a truly gripping, dark and visceral work of art. It’s the kind of movie that will resonate in your mind long after you’ve finished watching it, a film not easily forgotten is sadly a rare accolade in the era of popcorn movie making. Natalie Portman was absolutely incredible as Nina Sayers – she elevated the whole movie. I’ve loved her ever since she played Mathilda in Leon: The Professional way back in 1994. Of course anything with Vincent Cassel in it is pretty much a winner – he was disgusting slimey. The one that surprised me was Mila Kunis – she really can act – yah the girl from That ’70s Show! This will be a star-making role for her, she could well become an actress to watch. Black Swan really defies any genre classification, is it horror? thriller? drama? mystery? fantasy? It sure does take you on a ride though and it doesn’t let go, once it get’s started it never lets up either. It’s not overly long, there are no unnecessary parts and you are giving glimpses into all the characters. The look of the movie is very simple, it’s almost entirely black and white in terms of both costume and set. The colour of the clothes warn by the people in different scenes for example give some hint towards their intent (black for evil, white for good). It also manages to beautifully blend its own story with the original story of Swan Lake. The sound-track is subtle and doesn’t interfere with the movie, the sound effects can truly terrify you. All in all, it’s just a fantastic movie – I for one can’t wait to watch it again! I truly believe it’ll end up in the IMDB Top 250 movies sooner or later. I give it a stunning 8.5/10. yeah, watched it last night, it was good. not gonna read! wanna watch soon!!! watched liao. super love Portman. wonder if she is from ballet background. so ohsum. michaelooi: Hahah yah, hot and weird. Cheesie: Yah she does have some ballet background, but to get her body in shape for the movie she worked out for 6-8 hours a DAY for a whole YEAR!